Paint the pieces of the tree display with bright orange, leave to dry and then carefully assemble. 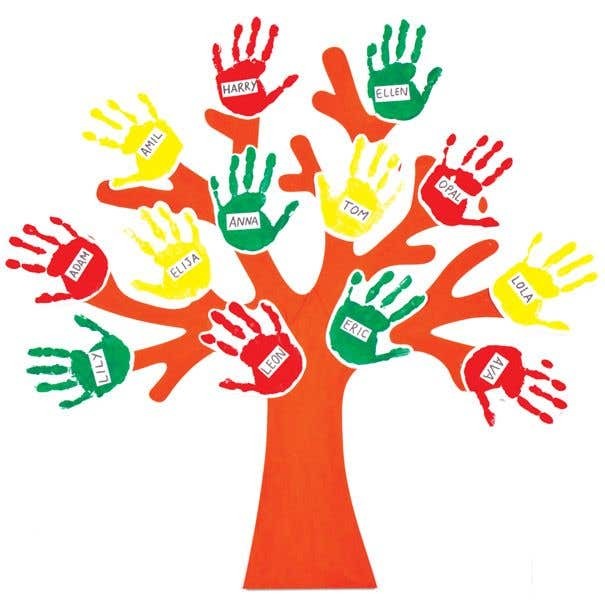 Each child needs to pick a colour, then make a paint handprint on white card. Leave them to dry, keeping a note of which handprint is which. Write each child's name on white card in black pen, then cut out and stick to the palm of their handprint with glue. Cut out each handprint carefully, leaving a border of white, and affix to branches of your tree display with Glue Dots or PVA. You might want to arrange them around the tree before you stick them down to ensure you've left enough room for them all. Now select where your tree display is going to be hung and secure to the wall or prop up on a table, ready to be admired.